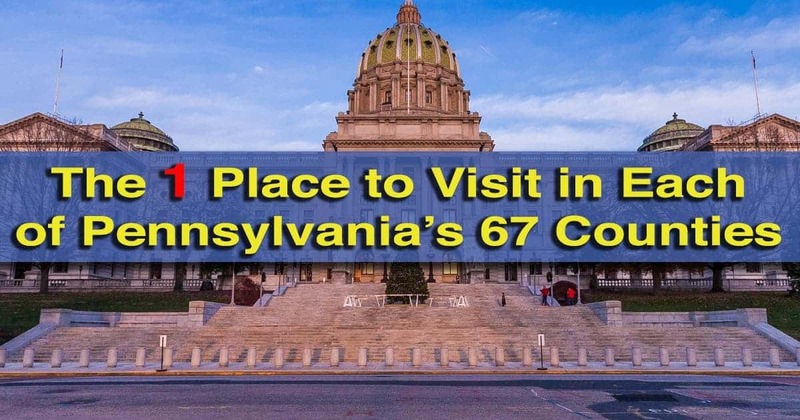 During my travels around PA, I’ve completed my goal of visiting at least one tourist attraction in all of Pennsylvania’s 67 counties. This makes UncoveringPA the only travel blog or guide that features honest and independent information about every corner of the state from someone who has actually been there. To celebrate, I thought I’d put together a list of the one destination that you should visit in each county. Compiling this list was definitely not easy as there is certainly more than one place to visit in every county. However, I looked at the list like this: if you’ve never been to a county before, only have time to visit one place, and will never be back, where should you go? Of course, my opinions may differ from yours. So, if you think I put down the wrong place for a county, please comment below and let me know what should have been included and why. If I have written about a destination, I’ve linked to my full article so that you can read more about it. A few places on the list I either haven’t written about yet or haven’t visited, but have heard great things. In those cases, I’ve linked to other sites where necessary. Adams County – Gettysburg National Battlefield: This list fittingly starts with one of the top destinations in the state. The Gettysburg National Battlefield interprets and showcases the events of the battle that occurred from July 1-3, 1863. This turning point of the Civil War is a must-visit in Adams County. For more information, check out my full article and video on the battlefield. Beaver County – Old Economy Village: Unfortunately, I haven’t yet been able to visit Old Economy Village during my visits to Beaver County. However, from my research, I definitely think that it deserves a spot on this list. The village showcases life in western Pennsylvania from the perspective of the Harmony Society, a religious society that immigrated to the area in the 19th century. Find out more on their website. Bedford County – Gravity Hill: If you’ve always taken gravity for granted, a visit to Gravity Hill in Bedford County, Pennsylvania, will leave you scratching your head. Whether it’s an optical illusion, ghosts, or a warp in the earth’s magnetic field, it’s fun to watch as your car appears to roll uphill along the roadway. Find out more in my full article and video about Gravity Hill. 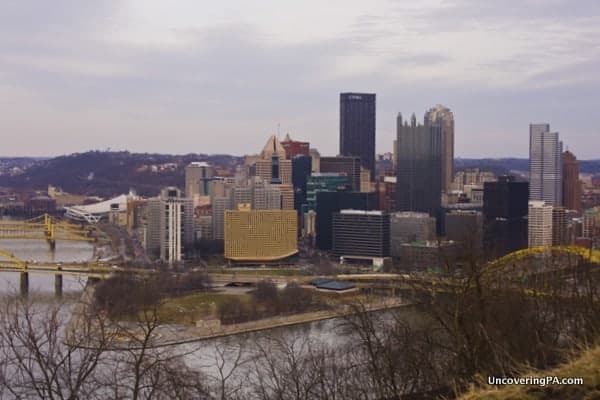 The view of downtown Pittsburgh from the top of Mount Washington is simply breathtaking. Berks County – Reading Pagoda: I haven’t yet had a chance to spend much time in Berks County, but the Pagoda is at the top of my list for things to do in the county. Built in the early 20th century as a hotel, the Pagoda is home today to an observation area, a small museum, a gift shop, and a snack bar. From the pagoda, you can see over 30 miles on a clear day. For more information, check out our article on the Reading Pagoda. Blair County – Horseshoe Curve: In the mid-1800s, it took several weeks to travel over the mountains from Philadelphia to Pittsburgh. However, with the opening of the Portage Railroad and the Horseshoe Curve, this time was cut to only a few days. Today, the Horseshoe Curve, an engineering marvel that allowed the train to climb the Allegheny Mountains, is a tourist site. Visitors to this still-active track can watch trains go by and marvel at one of the most important engineering feats of the 19th century. For more information, check out my full article and video about the Horseshoe Curve. Bradford County – French Azilum: During the French Revolution, many French aristocrats fled to America to seek safety. To help them resettle, a group of government officials set up a French settlement in what is now Bradford County. French Azilum only existed for a decade, but its story is still amazing today. Find out more about visiting in my article about the site. Bucks County – Fonthill Castle: Located on the outskirts of Doylestown, Fonthill Castle is one of three concrete structures built by eccentric local artist Henry Chapman Mercer. Fonthill Castle was Mercer’s home, and its castle-like appearance makes you feel as if you’ve been transported to the European countryside. Tours of this castle are well-worth taking the time to check out. Find out more in my full article about Fonthill Castle. Butler County – Maridon Museum: Butler, Pennsylvania, is one of the last places in the world you would expect to find a world-class Asian art museum, but the Maridon Museum is definitely one of the best I’ve come across anywhere in the United States. The museum is the product of one woman’s collection, which has been put on display for everyone to enjoy. Find out more about visiting in my article about the museum. 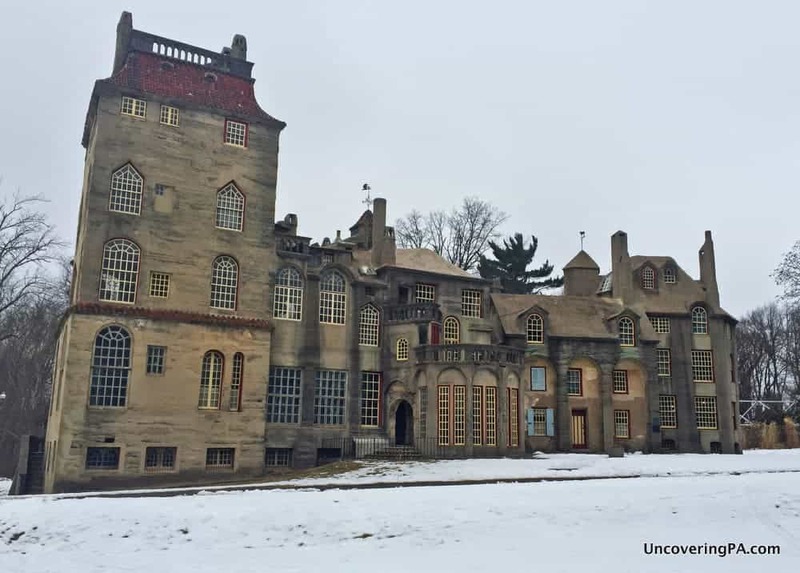 Fonthill Castle is my pick for the one place to visit in Bucks County, Pennsylvania. 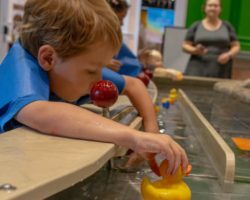 Cambria County – Johnstown Flood National Memorial: I haven’t yet had a chance yet to visit Johnstown, but when I do, the Johnstown Flood National Memorial will be at the top of my to-do list. The memorial commemorates an 1889 flood that destroyed the town and killed more than 2,000 people in the valley. For more information, check out our article on the memorial. Cameron County – The Little Museum: I’ve been to many great historical society museums in Pennsylvania, but The Little Museum in Cameron County stands out as one of the best. Despite having the fewest residents of any county in the state, there is a surprising amount of history to learn about. To find out more about this great museum, check out my full article on The Little Museum. 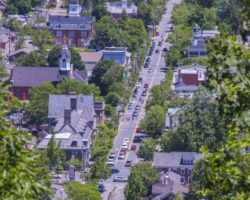 Carbon County – Downtown Jim Thorpe: There are a ton of great outdoor things to do in Carbon County, but if you only have time to do one thing, you should head to downtown Jim Thorpe. This quaint downtown area is nestled in a valley and surrounded by mountains, and is filled with small shops and restaurants. I haven’t yet had a chance to write about visiting the area, but you can find out more on the town’s website. Centre County – Columbus Chapel and Boal Mansion Museum: You might have thought I would have put a Penn State football game on here, but the Columbus Chapel and Boal Mansion Museum is just too amazing to not include here. The home is located in Boalsburg and was once owned by the borough’s namesake family. Inside the home are an amazing variety of items from locks of Napoleon’s hair to a piano that was once in the White House. Outside the home is the Columbus Chapel, which was once located in the Columbus family castle before being moved in pieces to the area. Find out more about this amazing place in my article about the Columbus Chapel and Boal Mansion Museum. Chester County – Longwood Gardens: There are many scenic botanical gardens around Pennsylvania, but none are better than Longwood Gardens. The gardens have been opened since the late 18th century and have been growing in size ever since. Today, there are more than 1,000 acres that visitors can stroll through while looking at and learning about some of the most beautiful gardens in America. 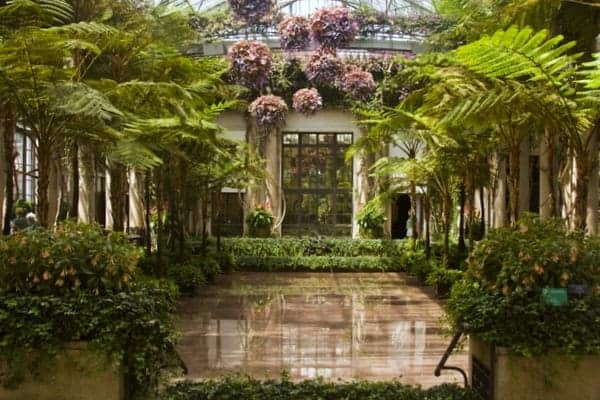 Find out more in our article about Longwood Gardens. Longwood Gardens in Kennett Square, Pennsylvania, has to be seen to be believed. Clarion County – Forest Cathedral Hiking Trails in Cook Forest State Park: One of the most impressive hiking trails that I’ve done in Pennsylvania is the Forest Cathedral in Cook Forest State Park. This series of trails takes you through one of the largest remaining old-growth forests in the state and has been designated a National Natural Landmark. For more information, check out my article on Cook Forest State Park. 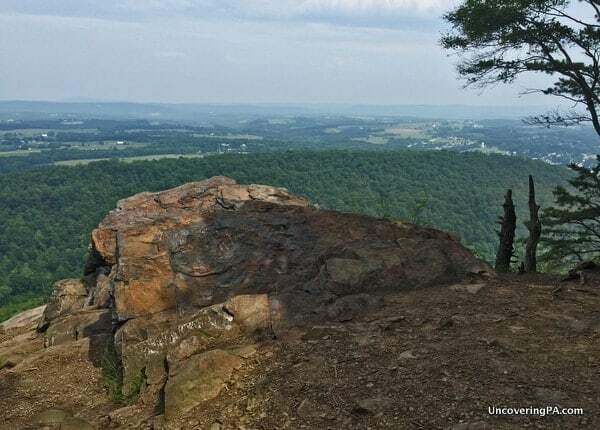 Clearfield County – Bilger’s Rocks: There are a lot of boulder fields in Pennsylvania, but few are cooler than Bilger’s Rocks in Clearfield County. What makes Bilger’s Rocks so fun is both the beauty of the area and the massive scale of the rocks. I could spend all day just running around and climbing over the field. Find out more information in my article about Bilger’s Rocks. Clinton County – Piper Aviation Museum: I haven’t spent much time in Clinton County, but one place that is on my radar for when I have a chance to spend more time is the Piper Aviation Museum in Lock Haven. Lock Haven was once home to the company’s headquarters, and it is still home to a museum dedicated to the company. Find out more in our article about the Piper Aviation Museum. Columbia County – Centralia: Columbia County is home to some of the state’s most scenic covered bridges. However, Centralia is too cool to pass up. This once-thriving borough is now a ghost town, thanks to the toxic mine fire that’s been burning underground for 60 years. Find out what there is to see and do here in my article about visiting Centralia. Crawford County – PennDot Road Sign Sculpture Garden: I almost didn’t go to the PennDOT Road Sign Sculpture Garden when I visited Crawford County, but I’m glad I did. 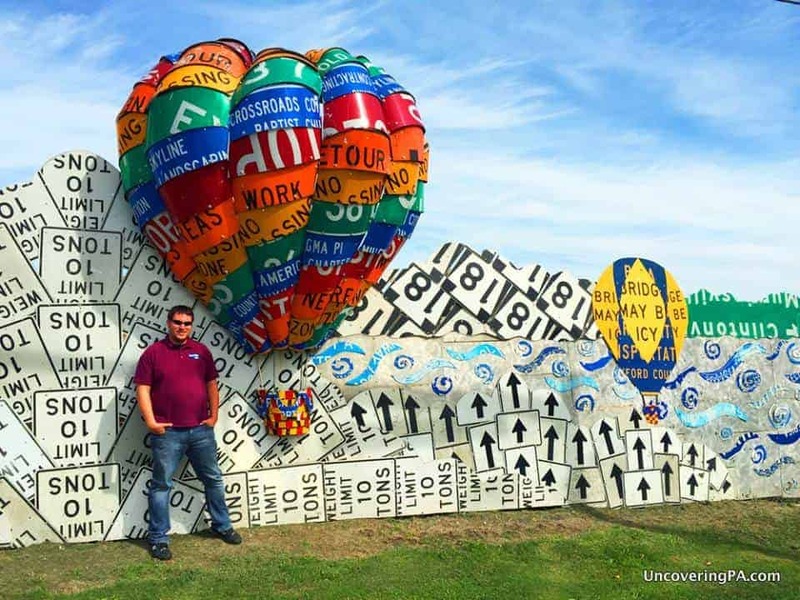 This 1200-foot long mural is made entirely of used road signs and unlike anything I’ve ever seen before. For more information about visiting, check out my article about it. A small portion of the PennDOT Road Sign Sculpture Garden in Meadville, Pennsylvania. Cumberland County – US Army Heritage and Education Center: If you’ve ever driven down Interstate 81 north of Carlisle, you can’t help but notice the large collection of military equipment on the side of the road. This is just a small part of the US Army Heritage and Education Center at the US Army War College. The site features a free museum with military items dating as far back as the Revolutionary War and a walking path with recreated forts and authentic military equipment. Find out more about visiting in our article about the center. Dauphin County – Pennsylvania State Capitol: When the Pennsylvania State Capitol was dedicated in 1906, President Theodore Roosevelt commented that it was “the handsomest building I ever saw.” Today, the building is still used as the state capitol and is open daily for both self-guided and guided tours. While it may be over 100 years old, the words of President Roosevelt still ring true about this beautiful building. 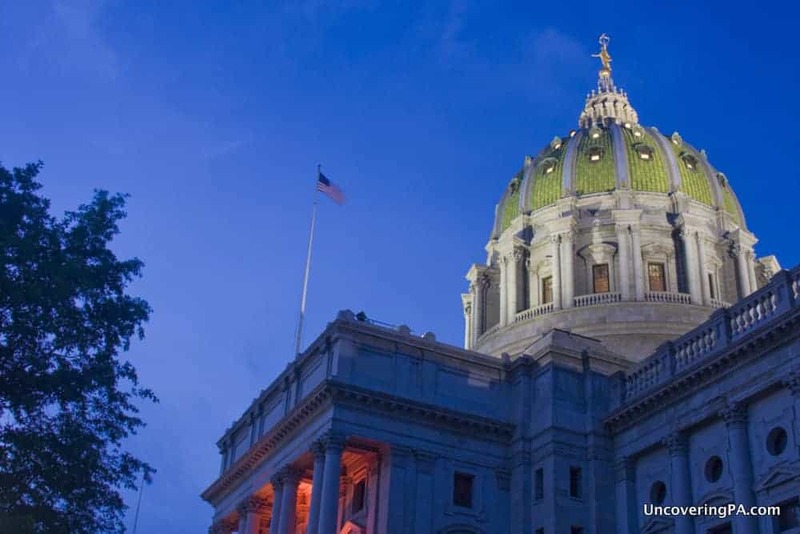 Find out more about visiting in my full article about the PA State Capitol. Delaware County – Brandywine River Museum of Art: Dedicated to the works of the Wyeth family and other members of the Brandywine School, the Brandywine River Museum of Art is one of the most beautiful art museums you’ll find anywhere in the state. The collection of art here falls into a very realistic style and doesn’t feel pretentious, like many art museums do. Find out more about the museum in my full recap. Elk County – Elk Country Visitor Center: Until about 100 years ago, elk were extinct in Pennsylvania. However, a reintroduction program has created a thriving elk herd that’s centered around Benezette, Pennsylvania. Today, visitors can travel to the area and visit a variety of viewing areas for the chance to see one of these majestic creatures. However, the place to start your visit is at the Elk Country Visitor Center. Find out more in my full article. Erie County – Beaches of Presque Isle State Park: Pennsylvania’s most visited state park is Presque Isle in the northwestern corner of the state. And, the main highlight of the park are the 13 beautiful beaches along Lake Erie. As Pennsylvania’s only seashore, the beaches of Presque Isle are one of the state’s can’t-miss attractions. Find out more on the park’s official website. The Pennsylvania State Capitol in Harrisburg is one of the state’s most beautiful buildings. Fayette County – Fallingwater: There might be no better known home in Pennsylvania than Fallingwater. 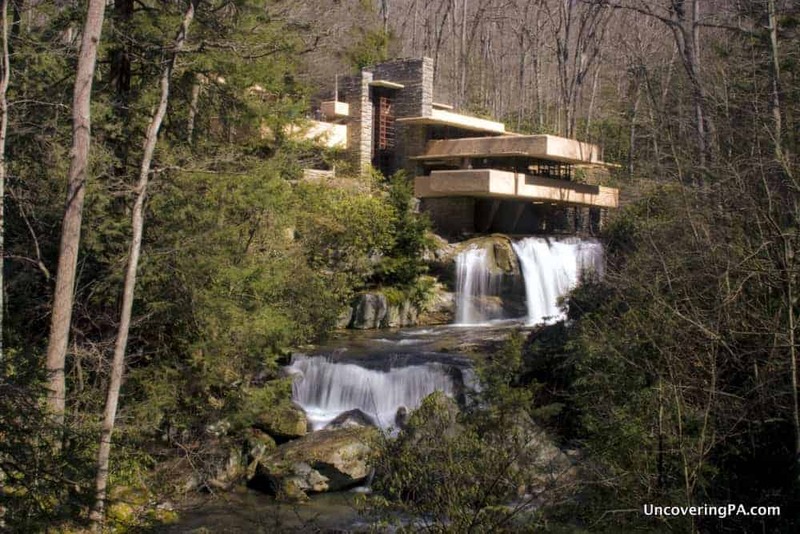 Designed by architect Frank Lloyd Wright, this beautiful home is situated in the woods near Ohiopyle State Park and stands over a beautiful waterfall. Find out more about visiting this home in this article about Fallingwater. Forest County – Sherman Memorial Lighthouse: Situated along a picturesque section of the Allegheny River in Tionesta is one of the strangest sights in Pennsylvania: Sherman Memorial Lighthouse. While it sits alongside a body of water, this lighthouse provides no navigational aid. Instead, it was built to commemorate the owner’s family. Find out more about the lighthouse and how you can visit it in my full article on Sherman Memorial Lighthouse. Franklin County – Buchanan’s Birthplace State Park: James Buchanan was the only president born in Pennsylvania, and his birthplace is now a state park. While the building that he was born in is no longer there, the spot has been memorialized with a stone pyramid. Walking around this small state park gives visitors the chance to learn more about America’s 15th president. Find out more about visiting the area in this article. Fulton County – Abandoned Turnpike: The Abandoned Pennsylvania Turnpike spans two counties, but is located mostly in Fulton County. This 13-mile stretch of abandoned roadway has two tunnels you can hike or bike through, as well as miles of abandoned roadway. For more information about visiting this amazing place, check out my full article on the Abandoned PA Turnpike. Greene County – Greene County Historical Society Museum: I’ve been to many different historical societies around the state, but one of the largest and best curated is the Greene County Historical Society Museum in Waynesburg. Located in an old home, the museum tells the story of Greene County, and how it has affected the world. Find out more information about visiting in my article about the museum. Fallingwater is Frank Lloyd Wright’s most famous home and is located in Fayette County, Pennsylvania. Huntingdon County – Hawn’s Overlook: Located on the northern half of Raystown Lake, Hawn’s Overlook has a view that has to be seen to be believed. The view looks over the largest lake that’s entirely within PA and offers a commanding view high above the lake, forested hillsides, and even a few small islands. Check out this article for information about visiting Hawn’s Overlook. Indiana County – Jimmy Stewart Museum: The borough of Indiana, Pennsylvania, honors its most famous native, actor Jimmy Stewart, with a museum in his honor. The museum sits in the heart of the downtown area where Stewart spent his childhood and chronicles his entire life, from his boyhood bedroom to his acting and military career. Find out more information on visiting the museum in my full article. Jefferson County – Gobbler’s Knob: Pennsylvania’s most famous event, Groundhog Day, takes place every year at Gobbler’s Knob in Punxsutawney. This strange tradition dates back 130 years and is something that everyone should do at least once. Find out more about visiting in our full article about spending Groundhog Day in Punxsutawney, Pennsylvania. Juniata County – Academia Covered Bridge: Pennsylvania is home to roughly 200 historic covered bridges, but none of them are longer than the 278-foot long Academia Covered Bridge. 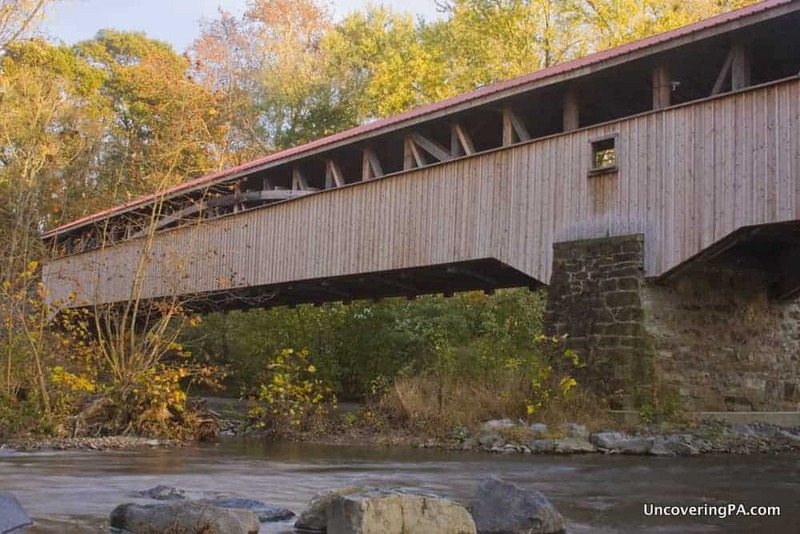 Built in 1902, this bridge has recently undergone a refurbishment and is now one of the most beautiful covered bridges in all of Pennsylvania. Find out more about visiting this bridge in my article about the covered bridges of Juniata County. Lackawanna County – Steamtown National Historic Site: If you love trains, there are few better destinations in Pennsylvania than Steamtown National Historic Site in Scranton. Home to dozens of train engines and cars, along with an extensive museum of train-related items, this is a great place to wander for hours. Better yet, on select days, you can take a ride on one of the museum’s historic trains. For more information, check out my full article on this amazing historic site. Academia Covered Bridge in Juniata County is the longest remaining covered bridge in Pennsylvania. Lancaster County – Lancaster Central Market: While many markets make the claim, it seems like Lancaster Central Market can actually lay claim to being the oldest continually operating farmer’s market in the US. Opened in 1730, the market has been serving Lancaster for 285 years and features a wide variety of food and beverages to suit any taste. Find out more on the market’s website. Lawrence County – McConnell’s Mill Covered Bridge: Truthfully, I could have put the entirety of McConnells Mill State Park here. However, since I had to pick one location, I’ve chosen one of the most scenic covered bridges that you’ll find anywhere. Spanning Slippery Rock Creek just downstream from a historic mill and man-made waterfall, McConnell’s Mill Covered Bridge is located in a breathtaking setting that might make you think you’re high in the mountains. Click here to find out more about the bridge. Lebanon County – Cornwall Iron Furnace: It’s not uncommon to see deteriorating furnaces in Pennsylvania, but there are only a few that have been well preserved. Cornwall Iron Furnace is one of these. Originally built in 1742, the mines sit adjacent to the largest iron deposit east of Lake Superior. The furnace here made iron used during both the Revolutionary War and the Civil War. Find out more about visiting in my full article about the furnace. Lehigh County – Mack Trucks Historical Museum: For many years, Mack Trucks were headquartered in Allentown. And, while that is no longer the case, their old testing facility has been turned into a great museum that tells the story of this iconic American company. Guided tours take you past turn-of-the-century trucks, modern trucks, and even movie props. If you love trucks, don’t miss this museum. Find out more about visiting in my full article. 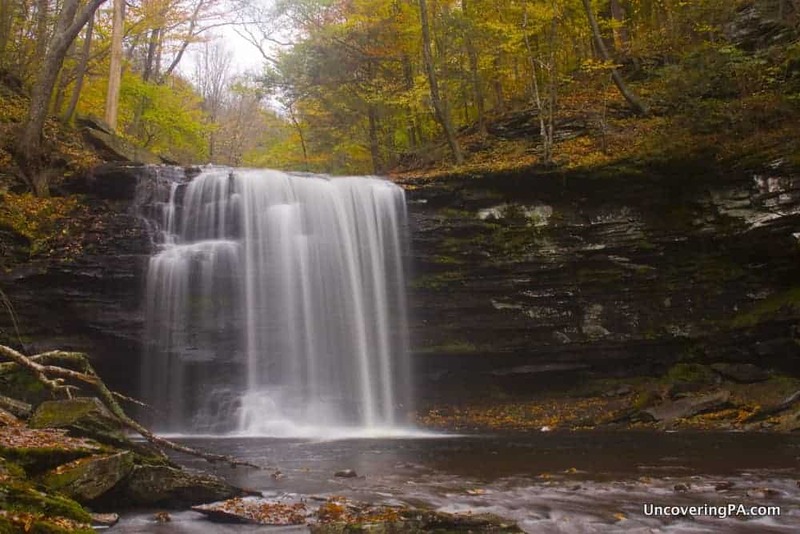 Luzerne County – Falls Trail at Ricketts Glen State Park: If I had to pick one place to visit in Pennsylvania, there’s a good chance that it would be the Falls Trail in Ricketts Glen State Park. This 7.2-mile trail features 22 waterfalls and some of the most beautiful scenery in the state. I’ve actually written four separate articles about this trail, but start here with my top tips for visiting. 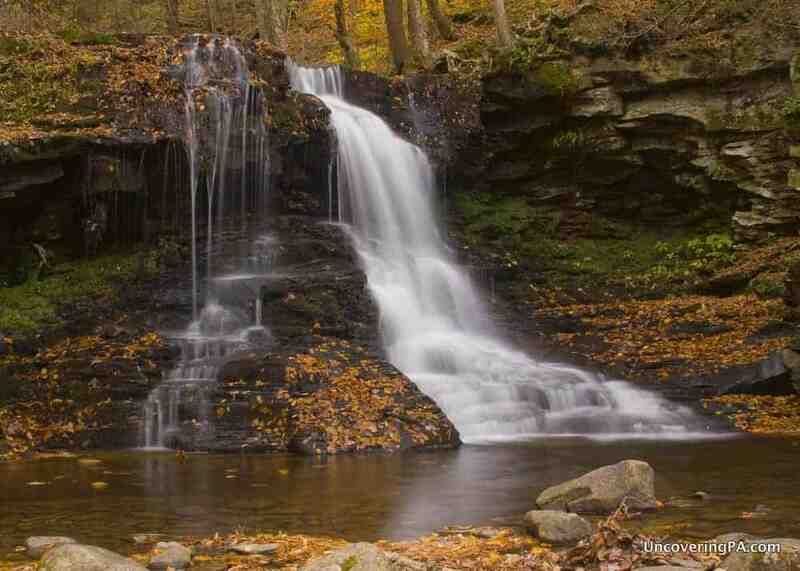 Harrison Wright Falls is one of 22 named waterfalls along the Falls Trail in Ricketts Glen State Park. Lycoming County – Little League World Series: For 10 days each August, the eyes of the world turn to Williamsport for the Little League World Series. In the event, the best Little League baseball teams from around the world come to the organization’s birthplace to compete for the championship. If you can’t make it to the area in August, the World of Little League Museum is a good alternative, but the Little League World Series is something everyone should do once in their lives. McKean County – Kinzua Bridge: When it was completed, Kinzua Bridge was the tallest railroad bridge in the world. However, a 2003 tornado destroyed 60% of the bridge. Today, the crumpled remains of the bridge still sit at the base of the valley, and the remaining bridge has been converted into an amazing lookout. You can find out more about visiting in my article about Kinzua Bridge. Mercer County – Daffin’s Candies: Daffin’s Candies in Sharon, Pennsylvania, claims to be the world’s largest chocolate store (it’s not), at around 20,000 square feet in size. That’s enough of a reason for me to visit one day. However, from what I’ve read, they also have some of the best locally-made chocolate in the state and feature their Chocolate Kingdom, complete with a 400-pound chocolate turtle. For more information, check out our full article on Daffin’s. Mifflin County – Big Valley Amish Communities: The Big Valley in Mifflin County is home to one of Pennsylvania’s largest Amish communities. What makes the community here interesting are the unique buggy colors that they use. Here, you won’t only see the grey buggies that you so often see in Lancaster County, but you’ll also see yellow-topped and white-topped buggies. Find out more about this area in my article about Mifflin County. Monroe County – Pocono Raceway: Even if you aren’t a fan of auto racing, there’s a good chance you’ve heard of the Pocono Raceway. The best drivers in the world head to this raceway to six major events throughout the year. To see which races are coming up, check out the raceway’s website. 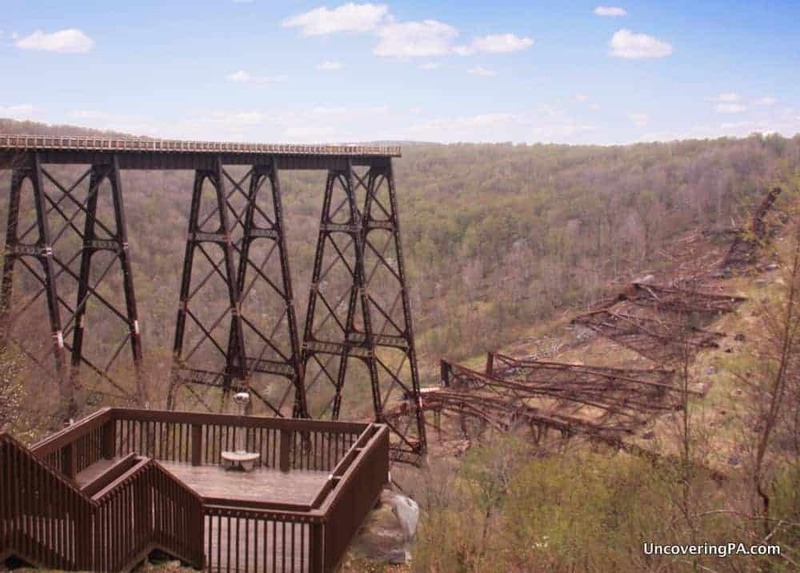 Kinzua Bridge State Park in McKean County is one of the most interesting parks in Pennsylvania. Montgomery County – Valley Forge National Historical Park: There are few Revolutionary War sites that are more well-known than Valley Forge National Historical Park. Here, in the winter of 1777-1778, the army of George Washington camped and went through one of its most difficult moments. Find out more about visiting the site in my full article on Valley Forge. Montour County – General William Montgomery House: The General William Montgomery House in Danville was built in 1777. Montgomery was a politician and fought in the Revolutionary War and was instrumental in the founding of Danville. Today, his home not only remembers him, but serves as the historical society’s museum for the entire county. More information can be found on the Montour County Historical Society’s website. Northampton County – Martin Guitar Factory Tour: Martin Guitars are some of the best guitars in the world, and many of them are still handmade in their factory in Nazareth, Pennsylvania. Those interested in seeing how these beautiful instruments are handcrafted can tour the factory floor. More information on this unique tour can be found in my full article on the Martin Guitar factory. Northumberland County – Knoebels Amuseument Park: Knoebels Amusement Park is America’s largest free admission amusement park and has been opened since 1926. This pay-as-you-go park straddles the border between Northumberland and Columbia Counties, but since a large portion of it is in Northumberland County, I decided to include it here. For more information, read our full review of Knoebels Amusement Park. 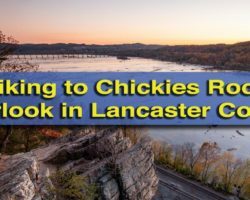 Perry County – Hawk Rock Overlook: Located along the Appalachian Trail just outside of Duncannon, Pennsylvania, Hawk Rock Overlook provides one of the best vantage points you’ll find of the Susquehanna River Valley. From here, there is an unobstructed view north along the river as it passes between Dauphin and Perry Counties. Find out how to reach this overlook in my hike recap. The view from Hawk Rock Overlook in Perry County is quite stunning. 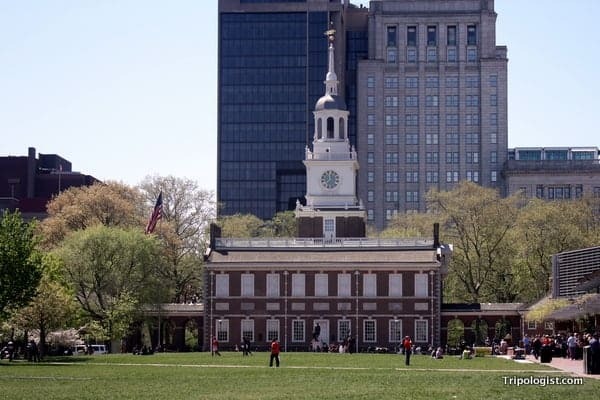 Philadelphia County – Independence Hall: There are a lot of amazing places that you can visit in Philadelphia, but if you only have time to do one thing, it has to be Independence Hall. It was here that our Founding Fathers declared their Independence from Great Britain and began the process of creating our country. Tours are free, but require tickets. More information on visiting can be found in our full article on the site. Pike County – Raymondskill Falls: Located in the Delaware Water Gap, Raymondskill Falls is Pennsylvania’s tallest waterfall. Here, the water falls over three tiers, adding up to more than 150 feet in height. The hike to reach Raymondskill Falls is quite easy, and there are other waterfalls that can be seen if you want to extend the hike. More information about visiting Raymondskill Falls can be found in this article. Potter County – Cherry Springs State Park: Cherry Spring State Park is known for one thing: being really, really dark. In fact, the park is the darkest place on the east coast and was the 2nd International Dark Sky Park in the world. If you want to see amazing stars, this is the place to go. Find out more on the park’s website. Schuylkill County – Yuengling Brewery Tour: Yuengling, America’s oldest brewery is located in Pottsville, Pennsylvania, and offers regularly scheduled tours. During the brewery tour, visitors can learn how beer is brewed and see the process for making one of America’s most well-known beers. You can even get a free sample at the end of the tour! For more information about visiting, check out our article about the Yuengling Brewery Tour. Snyder County – Selin’s Grove Brewing Company: Tucked away in the basement of a 200 year old home in downtown Selinsgrove is Selin’s Grove Brewing Company. This brewery has been around since 1996, after the owners/brewmasters two year stint at New Belgium Brewery Company. While they have remained small by choice, this brewery produces some of the best beers you’ll find anywhere in Pennsylvania. For more information, visit the brewery’s website. Independence Hall is the birthplace of America and a must-visit site in Philadelphia. Somerset County – Flight 93 National Memorial: The events of September 11, 2001, won’t soon be forgotten. On that day, one of the four hijacked planes crashed into the ground near Somerset, Pennsylvania. Today, the site is open as the Flight 93 National Memorial and is open for visitors. A visitors center was opened in 2015, but the serenity of the site remains. For more information visit my full article on the memorial. Sullivan County – Dry Run Falls: Sullivan County is known for its amazing outdoor destinations, and none are better than Dry Run Falls. Located in Loyalsock State Forest near Worlds End State Park, this waterfall is located right next to a lonely dirt road and makes for a fantastic place to see the beauty of Pennsylvania. Find out more in my article about Dry Run Falls. Susquehanna County – Fall Brook Trail in Salt Springs State Park: The Fall Brook Trail in Salt Springs State Park isn’t as much a trail as it is a hike directly through Fall Brook. However, what this trail lacks in an actual dry trail, it makes up for with three beautiful waterfalls and a fun hike climbing up and along these beautiful falls. Find out more about hiking this trail in my piece about hiking in Salt Springs State Park. Tioga County – Pine Creek Rail Trail: Stretching 65 miles from Wellsboro to Jersey Shore, the Pine Creek Rail Trail runs along Pine Creek through the Pennsylvania Grand Canyon. The trail can be accessed on either end, from several trails, or at a handful of access points in the middle. For more information, check out my experience biking the Pine Creek Rail Trail. 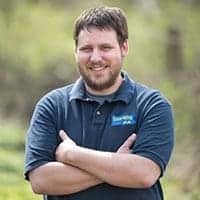 Union County: Clyde Peeling’s Reptiland: If you love reptiles, there’s no better destination in the state than Clyde Peeling’s Reptiland. Opened in 1964, Reptiland has grown to more than 75 species and 2,000 animals. The zoo is home to many rare animals, including two rare Komodo dragons and two species of giant tortoises. Find out more about visiting in my full article about Clyde Peeling’s Reptiland. Dry Run Falls is one of the most beautiful waterfalls in Pennsylvania and is easy to reach. 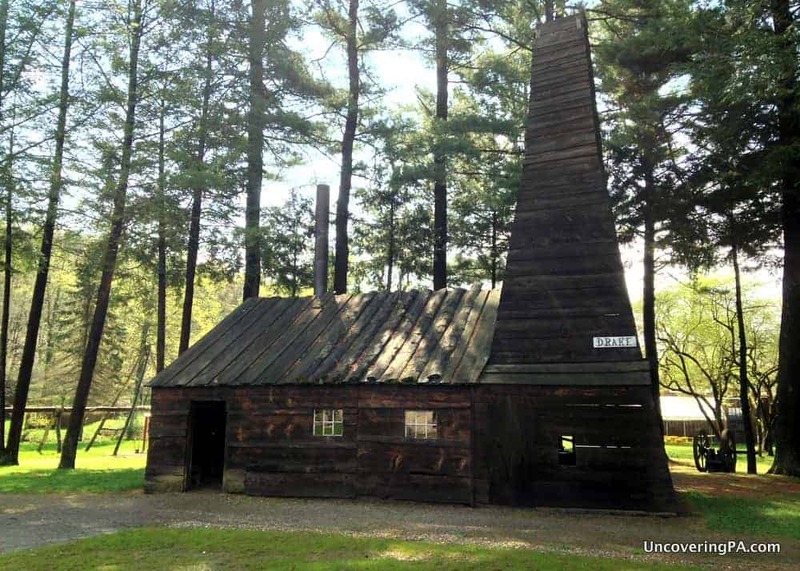 Venango County – Drake Well Museum: Few know that the world’s oil industry started right here in Pennsylvania. The Drake Well Museum on the northern edges of Venango County marks the spot where this earth-changing industry began. Visitors can see the site of the original well, early oil drilling equipment, and a great museum about the history of the oil industry. For more information, check out my article on the museum. Warren County – Rimrock Overlook: Warren County is home to one of the best lake overlooks in the state: Rimrock Overlook. In addition to the overlook, there is also an area of hiking trails accessed via a stairway cut into the rocks. For more information, check out my article about visiting the southern shores of the Allegheny Reservoir and Rimrock Overlook. Washington County – Meadowcroft Rockshelter: While it might be surprising, the oldest known site of human habitation in North America is located in Washington County, Pennsylvania. The history of Meadowcroft Rockshelter dates back at least 16,000 years, well before it was thought humans migrated to the Americas. In addition to the rockshelter, the site is a great place to learn about the history of Native Americans and settlers in western Pennsylvania. Find out more in my article about the site. Wayne County – Tanners Falls: There are many amazing waterfalls in the Poconos and Northeastern Pennsylvania, but one of my favorites is Tanners Falls in Wayne County. 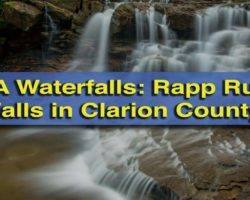 Located on State Game Lands, this waterfall cascades down two drops directly underneath a dilapidated bridge. Next to the waterfall, the remains of a few buildings still exist and make for a great exploration. For more information about visiting, check out my full article on Tanners Falls. Westmoreland County – Fort Ligonier: Dating back to the French and Indian War, Fort Ligonier explores what life was like for the British soldiers who fought in western Pennsylvania during the war. The recreated fort features a fantastic museum, authentic demonstrations, and lets visitors learn about a little-known period of history. Find out more in my full article about Fort Ligonier. The Drake Well Museum is where the world’s oil industry began and is located in northern Venango County..
Wyoming County – Tunkhannock Viaduct: When the Tunkhannock Viaduct was completed in 1915, it was the world’s largest concrete structure. Today, this bridge still carries daily train traffic across the Tunkhannock Valley. The bridge is an imposing presence over the borough of Nicholson and has to be seen to be believed. For more information, check out our article on this amazing bridge. York County – Martin’s Potato Chip Factory Tour: York County takes pride in its many factory tours, and none are cooler than the tour of Martin’s Potato Chip Factory in Thomasville. Tours here give visitors a chance to walk along the factory floor and see where some of the state’s best chips are made. Find out more in my full article about the tour. Do you have a favorite spot that wasn’t include in this list? Let me know what and why in the comments section below. Who knows…I might even change my mind and add your favorite place to the list instead! I highly recommend the Lackawanna Coal Mine Tour. It’s a really great tour. I have been to both. And choosing one is impossible. Steamtown is amazing if you are a true locomotive fan. The power of a steam engine entering the roundhouse is downright mind boggling. I was so close I wanted the event to never end. The anthracite I museum and mine tour were equally powerful. Where Steamtown was raw power, the anthracite museum was pure emotion. Anger and pride just ripples thru your core as you you read and view all exhibits. Mine owners must have a special place set aside in hell. Mother Jones and the union men along with their families are gladiators to me. I believe there should be a tie. Visit both. Drake Well is in Titusville, Crawford Co., so you’ll have to choose between it and the signs. I miss driving past the signs every day on my way to work in the years I lived in Meadville, they always made me smile. Do you have something for Venango Co.? I’m thinking it over and not coming up with much, either, but that’s no excuse to give Venango Co. credit for something awesome in Crawford Co.
That’s actually a very common misconception. While it does have a Titusville address, Drake Well is actually just across the border in Venango County. However, if you’re looking for more things to do in Venango County, here’s a list I put together earlier this year: https://uncoveringpa.com/things-to-do-in-venango-county-pennsylvania. While Reptiland still sounds awesome there is a Komodo Dragon at the Pittsburgh zoo too. Otherwise great article. Thanks. I’d researched that, but must have missed it. I’ve corrected the issue. Clinton county – the Labor Day regatta is a fun thing to see, as well as hyner state park which is beautiful any time of year but they have hang gliders launching off from the view during Labor Day as well! Hyner State Park does look great. I need to get there at some point for some photographs. I would have thought Penns Cave would have been Centre Counties entry. That would probably have been my second choice because it is really awesome. However, Columbus Chapel and Boal Mansion is simply amazing. One of my top 10-20 places I’ve been in the state. For Snyder County I would have picked Mt. Pisgah altar. Beautiful scenery any time but can’t be beat during the fall. I’d much rather be there than the basement of the brewery. But to each his own. It was more about the quality of the beer than the location. However, Mt. Pisgah is very nice. Can’t argue with that. I feel Dauphin County should include more than just the Capitol because there are so many amazing spots in the county that get forgotten because of Harrisburg and Hershey. And even so, I’d rather visit Hershey than Harrisburg. There is a lot more to do in Dauphin County than just the Capitol. However, this is a list of the one place people should visit in each county. And, in my opinion, a tour of the Capitol is the thing to do if you can only do one thing here. Also in Greene County, there is something called the Bituminous Coal Show and Festival, in Carmichaels. I’ve caught the parade there, during which they crown the Coal Queen. I really enjoyed my day in Greene County. Unfortunately, I haven’t had a chance to visit either festival, but have heard of them and would love to some day. The historical society is a really great museum and one of the best historical society museums I’ve visited in the state. I live in Somerset County and am curious as to what place would have been on the list prior to Flight 93 memorial. The Quecreek Mine Rescue Site is very cool too, but that’s not much older. Putting those two out, I’m not entirely sure off the top of my head. Packsaddle Covered Bridge is very cool for being the only covered bridge in the state with a natural waterfall underneath. Wendell August Forge in Grove City, Mercer County, America’s oldest and largest forge, is more historic and interesting than a chocolate store! Great list, Jim. Continuing the discussion in Somerset County besides Que Creek and Flight 93 Memorial my vote would have been for the Great Allegheny Passage trail. Mount Davis, the highest point in Pa. also deserves consideration. Lebanon County has the National Cemetery at Fort Indian Town Gap. You will be proud to be an American. It must be very difficult to figure out just one spot for each county. There are so many things in each one. Most of them were what I expected but there were a few surprises. I realize that Gravity Hill in Bedford County is one of the spots that has some appeal, but there are so many more spots that would seem to fit better. Fort Bedford (may not have been chosen because of Fort Ligonier), Old Bedford Village, numerous covered bridges, Omni Bedford Resort, the Jean Bonnet Inn or even Blue Knob State Park which has the second highest point in PA. Those are just the points around Bedford itself. I would even suggest the former site of the S.S. Grandview Hotel on the Historic Lincoln Highway where you are able to see three states and seven counties. Just a suggestion. It was very difficult narrowing it down to one place in each county. I’m definitely hoping to do lists of the best places to visit in each county as I have a chance to spend more time in each county. All of those sound like great options for the Bedford County list. In Fayette county. Jumonville’s Cross near Uniontown. Has the huge cross on top of a mountain. You can see for miles. The hike around the area is beautiful. Just right off of Route 40. Which is an historical national road. Just the cruise on route 40 only has many attraction and old historical towns. I think route 40 goes through 3 states. And an old castle in Brownsville, Nemicolin Castle. It’s on route 40 also. The list can go on just for the cruise on route 40. Jim Cheney; Thanks for the listing! I live in N-E Ohio, so thanks to this list you’ve provided a few more ideas for day trips! Great list! I am originally from Venango County, and now reside in Westmoreland. I would love to see a whole list for each county (you know, in your spare time lol). Thanks again for all the good info…I feel a road trip or two coming on next summer! Eventually, I’d like to do that, at least for the lesser known counties. For what it’s worth, I did do one a while back for Venango County: https://uncoveringpa.com/things-to-do-in-venango-county-pennsylvania. I like your blog a lot, but I don’t see how you can recommend Old Economy Village sight unseen. I understand you point, and usually, I only recommend places that I’ve been. However, I also do a ton of research and talk with others that know areas better than I do. Great list…Why have I not heard of you before? That’s definitely another great thing to do in Crawford County. Indian Echo Caverns would be a great place to visit in Dauphin County also. I really like Indiana Echo Caverns. It’s a great place to visit. Hello! Love all of your articles! Lol… if you ever get the chance, I’d love to read about *swimming holes* off the beaten path. I have kids and just don’t have a lot of time to explore new places, but would much rather swim naturally than in a c hemical pool. It’s hard to decipher what places allow swimming or are suitable for such activities. Great List Jim. I think all the counterpoints from readers are amusing and admirable of their pride. But those pennies hammered into the waterfall rock is an eye sore and illegal on the level of graffiti. I don’t think it’s a highlight. You must be compelled to feature it because it’s a popular view. I don’t intend any hostility. Maureen, I’m assuming you are talking about Penny Rock at Salt Springs State Park. While it is strange, and I understand your point, it’s actually on the park map as a highlight of the park, so I think it’s worth mentioning. Hey Jim – Just stumbled to your site via a post from a friend on Facebook. Great job! I love Pennsylvania and love knowing about your website. I’m passing on the info to my students so they can have a wonderful resource for their “Sense-of-Place” projects. Thank you very much. Rock ‘n’ Roll!!! That’s great to hear, Larry. Glad to have you following along. I grew up near Clearfield, great choice about Bilgers Rocks! Would like to hear more. I live in Union County. I would have picked something other than Reptiland. Just my personal opinion, Linda. That’s a great thing about a list like this. Everyone can have their own favorites. Lots of great choices in Union County. york county has so much more to offer than factory tours, which bore the hell out of everyone. check out the gates & plough or the motorcycle museum or the shoe house or the rocky ridge lookout or downtown for amazing architectural variety or the hex murder house or just a walk along the river. don’t sell this city short. Lots of great things to do in York County, but the factory tours are typically fascinating and very unique. Great idea for a blog post. I think a lot of people don’t realize how beautiful (and big) Pennsylvania is. When my in-laws were still alive, we would drive to Pittsburgh from Philly to visit them at least twice a year. Most of the Pennsylvania Turnpike is actually very scenic. While I certainly agree with your choice of Independence Hall for Philly, I wouldn’t have quibbled if you had counted all of Independence National Park as one place. This piece is definitely a worthy share on my Boomeresque FB page. Thanks, Suzanne. I tried to be as specific as I could with each county. For example, I didn’t simply pick an entire park, but a certain part of the park that I think makes it special. Lots of great things to do in the entire Independence National Park, though. Being from Juniata and knowing that this quaint county doesn’t have anything real fancy to offer, I was intrigued at what you’d pick. Of course, it’d have to be the old Academia bridge! I’m not sure why I didn’t think of that, haha! I used to live a few miles from it. Out of curiosity, was there any other options for Juniata? I appreciate your list, but I’d like to suggest Hawk Mountain in Kempton, PA for Berks county in your next list. It’s got several trails to get to a lookout on a raptor migration flyway., and when the Hawks and eagles fly by, it’s amazing! I am so thrilled that you included the Boal house and Columbus Chapel. My family came upon it by happenstance many years ago while taking the long route back to NEPA from Ohio and we were knocked over by all the stuff in that chapel. It was such a surreal thing. The chapel was locked with just a padlock, and looked like an ordinary outbuilding but within it is a history that people cannot even imagine. I tell everyone about it whenever they’re traveling out that way. Great article! Unfortunately, I don’t have that information, PJ. The largest community is in and around Lancaster County, but there are many smaller communities around the state. In fact, I’d guess that most counties in PA have at least some Amish presence. You should add Moraine State Park and McConnells Mills for Butler County. Beautiful sites to see. I thought about doing Moraine State Park for Butler County, but opted for the fantastic Maridon Museum instead. McConnells Mill Covered Bridge is listed as the place to visit in Lawrence County since the whole park is actually in that county. For Monroe you picked the race track over the Delaware Water Gap National Recreation Area? And the State Police are actively trying to keep people out of Centralia. The whole thing was to pick one place, not a whole park. I did put Raymondskill Falls, which is in the Delaware Water Gap, as the spot for Pike County. However, I figured that one of the most well-known NASCAR courses was worthy of the top spot for Monroe County. As for Centralia, I’m still trying to nail down exactly what’s going on. If it is a permanent change, I will change it, but won’t do so until I can find out more information. Great list! A couple random thoughts though. For McKean County, I would have picked the Zippo Museum, a great spot with lots of historical info especially related to WWII. For Potter County, the Austin Dam Memorial is a haunting site. Otherwise, enjoyed this tremendously. Both the Zippo Museum and Austin Dam are great spots to visit. No question about that. Great post! I thought it might be worth suggesting to date your post with the year, since I do have an interest in making sure I’m reading the most current post of a topic. Also worth consider…if possible, you may want to consider displaying dates on each comment. For comments regarding recent changes, such as Centralia above, I was curious when you discussed that. 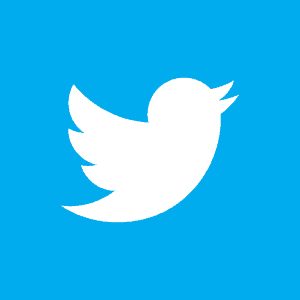 I really enjoy your blog, so thank you for sharing the great content! YORK CO. = Steam into History Inc. runs a replica of a Civil War passenger train (completed in 2013) between New Freedom and Hanover Junction south of York, 6 miles west of Exit 4 (Shrewsbury) on I-83. President Abraham Lincoln changed trains at Hanover Junction when he delivered his Gettysburg Address. I do want to point out though, Raymondskill Falls is not in Delaware Water Gap, it is located in the Delaware Water Gap National Recreation Area. Delaware Water Gap is a town in Monroe County at the foot of the recreation area about 30 miles south of the falls. Could get a little confusing for travelers. It’s impossible to beat the Rickets Glen waterfall hike, but I’d mention that Luzerne Co. also has Eckley Miner’s Village. It’s a collection of preserved houses from a coal mining town, and includes an outstanding museum about life in a coal mining town. Beautiful area and must see PA history! Thanks for such a great list for all us Pennsylvaniaphiles, and for starting a conversation about other PA attractions! I just discovered your site and absolutely love it. Thank You. Do you know any sites like this for other states? Unfortunately, I don’t really. I do hope there are some out there though. Glad you like the site. Just found this site. I commend your fine effort to share Pennsylvania with others.